The Green Clinic is open for business, ready to serve people searching for medical marijuana. KANSAS CITY, Mo. — The Green Clinic is open for business, ready to serve people searching for medical marijuana. Officially open since Feb. 1, the clinic hosted a grand opening on Wednesday at its location in the River Market. CEO Emily Branch says she opened The Green Clinic because, "Regular doctors are unable because of the federal ban to write these certifications that are so often required when someone applies to the state." A consultation costs $299 for the general public, $149 for veterans and $49 for people on any type of government assistance. On June 4, the state will open up the process to start applying for a card to legally purchase medical marijuana. "Right now, if you come into our clinic, our doctors will give you what's called a pre-certification or a post-exam letter,” Branch said. Dr. Kelly Logan, Medical Director at The Green Clinic, said, "We have nine diagnoses we're working with. If you have documented medical record of one of those nine diagnoses, it's pretty cut and dry. If you don't, you don't qualify." 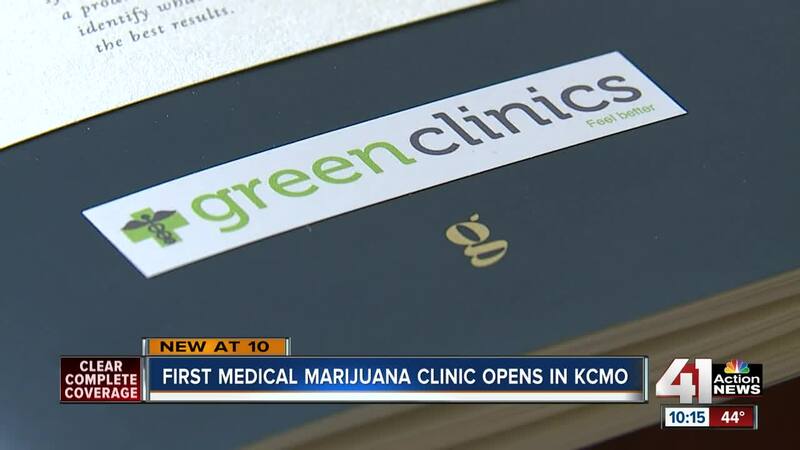 The Green Clinic is located at 415 Delaware in Kansas City and can be reached at 816-514-0023. Their hours are Monday through Friday from 10:00 a.m. to 6:00 p.m. and Saturday by appointment.